We had to go back THREE TIMES! One of the repairs I was asked to confirm for this Fort Worth inspection Client was a leak in a cast iron drain pipe into the crawlspace, under the bathroom. 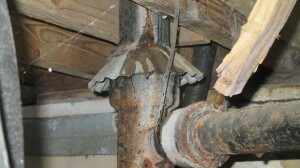 I had found this leak at the original inspection, and provided a photo in the inspection report. The Buyer asked the Seller to include this repair, and to provide documentation that a licensed plumber had completed the job. The Seller agreed and called their warranty company, who sent a contract plumber. I was contacted nearly two weeks later to do a re-inspection of all the items on the repair list, which I scheduled and showed up to do. Saving the crawlspace for last, I turned on the water at the vanity sink and tub, and flushed the toilet two or three times. Proceeding into the crawlspace, I saw immediately that no one had repaired the leak I had reported previously. I informed the buyer as soon as I came out of the crawl. The phone calls lit up the satellites for hours, but I was contacted again in a day or two to come back and check for repair of the leak. The good news in this whole scenario is that I had inspected this particular house four years earlier for the present owners (the Sellers), so I already had a strong professional relationship with them. I called the Sellers to see what had happened, and whether they needed me to talk to the plumbers. The owner told me that the “large plumber” who came out first never got into the crawlspace. He told her he thought he knew where the leak was and that he had tried to fix it from inside the house. He had opened up a wall and charged them for doing some work at the tub drain. The owner said she would be calling to schedule someone else to come do the job. now the tub drain was leaking. All I could figure was that when the plumber sawed through the old pipe to fix the leak, it shook the tub drain loose. When he checked the vanity sink drain there was no leak, but he never thought to turn the water on at the tub or flush the toilet. This new leak was way worse than the first one! Another visit from the plumber ended the story with the re-inspection count at 3! However the repairs had been completed, and I did not have to go back for number 4. The sale closed only a week behind schedule, but everyone was happy, except the plumbers. No sympathy here. There are certainly times when Re-inspections are a good idea. But the main thing in considering whether to re-inspect is get documentation from licensed individuals who were supposed to do the work. If it’s a handyman, get invoices and check out their credentials. If it keeps you up a night or two worrying whether the job was done well, a re-inspection might be a good idea. One more takeaway: read the fine print on any homeowner’s warranty you buy. Caveat emptor! Let the buyer beware! By the way, homeowner’s warranty repairs may be a topic for another blog post, cause I definitely have my opinion about them. But WAIT! maybe you would like to relate your own story of horrible warranty contractors, right here. Leave a comment. Feel free, but keep it clean, please! I monitor this blog.